I started making jewelry out of recycled computer parts when a friend remarked that some Christmas ornaments I'd made from them would make great earrings. So I decided this is a great way to keep as much computer waste out of the landfills and make them into something else new and useful. I've now expanded into using bits and pieces off motherboards (such as inductors and capacitors) and once I get a small scroll saw, be cutting motherboards into smaller pieces for pendants and such. When I am not using the whole motherboard itself in a larger art piece. Almost all earrings can be converted to post, ear wire or clip-on at no extra cost (ear wire or clip-on not recommended for the heavy actuator arm earrings). Just let me know your preference when you order. I love mixing natural materials such as sea shells with recycled technology from computers. I also digital paint and take photos. In fact, I got started on the artistic road when I got my first digital camera and haven't looked back. 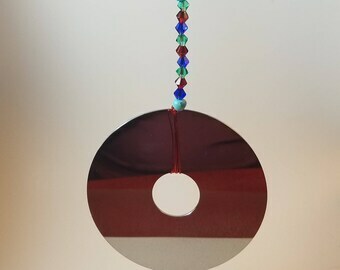 Welcome to Purple Ducky Designs, where you can buy unique pieces of wearable art, mobiles and light catchers. No two pieces alike. Satisfaction guaranteed. Items are not exchangeable. Returns are accepted only if the buyer is unhappy with the product. I will not refund for damaged, broken, or lost pieces. If the customer wishes to return a set of jewelry, all pieces must be returned before the refund takes place. The seller is not responsible for items damaged or lost in the mail, but will take precautions to ensure that such problems do not occur. All sales are final on files and images that are sent to you electronically (via email). Items will be shipped via the USPS. International recipients are held accountable for any extra shipping costs over $8.00 U.S dollars, and all customs fees and international fees.